Megan M. Mecouch paints a compelling picture of her life-changing international experience. Throughout the 2017-18 academic year, the Penn College Foundation awarded more than $767,000 in scholarship support to nearly 400 students. External private foundations have taken note of the college’s impressive growth, contributing millions of dollars toward education and opportunity for deserving students. Expansion of welding facilities on campus and the practical nursing program in Tioga County will accommodate increases in enrollment and enhance the college’s historic response to workforce needs. 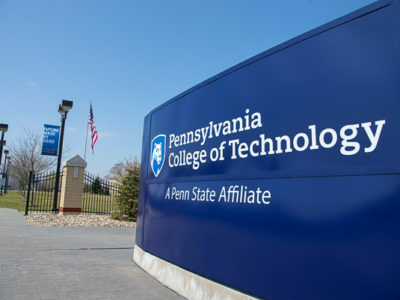 Collaboration and innovation are “alive and well” in the Dr. Welch Workshop: A Makerspace at Penn College, where more than 300 pioneering students have completed training in the first year alone. Donor-enabled improvements to Wildcat facilities are being matched by students’ academic and athletic performance. Student Development Assistant and scholarship recipient Zachary J. Kravitz, a construction management student from Berwyn, shares his thanks and Penn College experience while engaging through the crowd. Joining him as he networks is Angie E. Myers (standing at right), director of annual giving. Seated (from left) are scholarship donors Tina and Ron Miller (with son Evan); and Kimberly R. Cassel, director of alumni relations. Mecouch told of her August study-abroad experience in the Dominican Republic, a practical reflection of her longtime interest in helping those less fortunate. She was among 17 students who (accompanied by two faculty members) provided preventive dental hygiene services – cleaning teeth; applying sealants; and distributing toothbrushes, toothpaste and education – to hundreds of children during the weeklong outreach. The student speaker talks with Pillar Society members Dennis F. and Patricia A. Ringling, a retired forestry professor and his alumna spouse. Elatedly sharing her gratitude for the “amazing experience,” Mecouch said the visit ignited a fire for volunteer work that will continue to burn throughout her life. Marie E. Knecht (who, along with husband William G., has long empowered and encouraged students) gets an up-close glimpse of how that garden has grown. “One of my favorite memories was one in which we were in a village, where it seemed as if there was no hope, and we brought paint cans filled with vibrant-colored paint and paintbrushes and created a mural of hope for the community,” she related.